People all around the world use WhatsApp to connect with businesses – from online clothing companies in India to auto parts stores in Brazil. For such businesses which run on WhatsApp, each day they get hundreds of enquires from their potential customers. We know WhatsApp is all about phone numbers! As business grows, people face challenges and the most important is to manage the customer directory. It takes a significant amount of time to save all the customers contact details from WhatsApp & keep them handy. 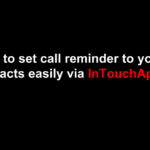 No solution exists today except InTouchApp, which helps businesses save all customer contacts to their phone with just a few clicks! We understand business is all about hustling & we want to be a part of this journey by helping all such business to manage their customer directory hassle free. Write to us in the comments below if you have any suggestions or questions!